After a long week, worringly they seem to be increasingly that way these days, we decided to visit Koya in Soho for some Udon noodles. Koya has a simple Japanese feel with a blue noren (curtain) hanging outside and simple wooden tables inside. The menus are written on the walls, with everything in both English and Japanese. Individual, clean and simple I was a fan. Less impressive than the interior was the speed in which the wait staff took our order. Despite having quite a few staff for a small restaurant, they seemed to be rather disorganised and it wasn't until the manager / owner noticed our plight and sent someone over that we finally managed to order. 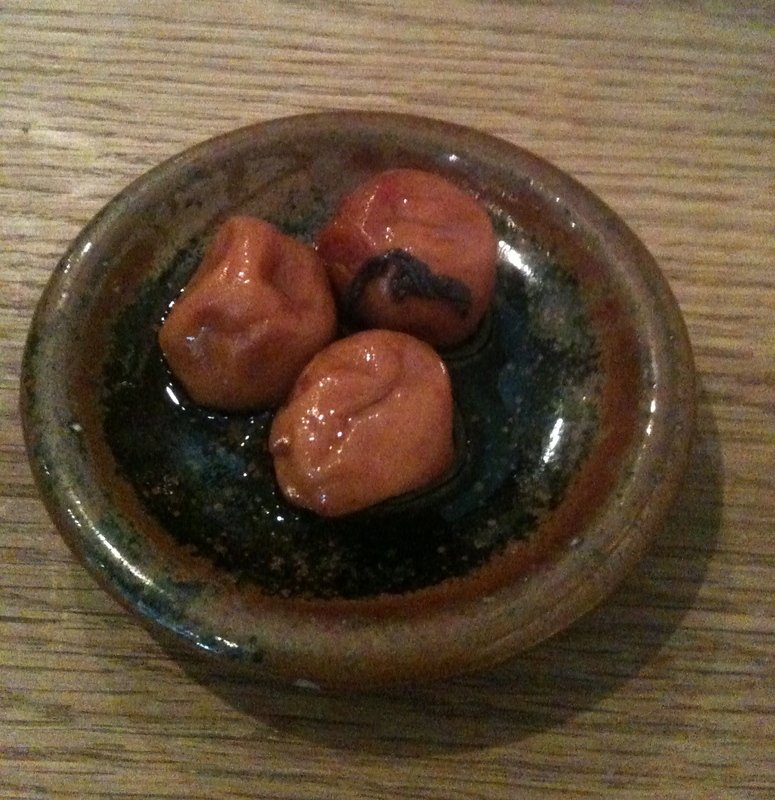 We started with some umeboshi (pickled plums £2.30) that were sour and had a developing heat as you ate them. A nice little appetiser. We also ordered some samphire tempura (£5.90) from the specials board. The batter was light and crispy, coating the soft samphire. 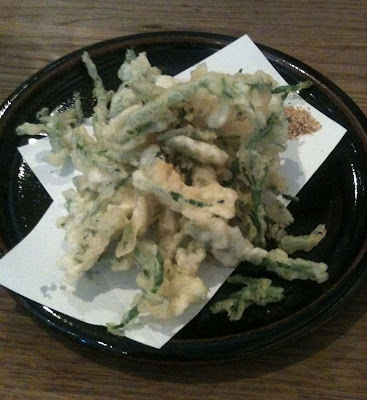 Accompanying the tempura was a small pile of moorish lime salt. After our starters came the main event, bowls of handmade udon noodles. I ordered the kizami (£8.40), udon noodles served with fried tofu with spring onions. When the bowl was placed in front of me my initial thought was "is this it? ", but I was soon enjoying the purity of the dish. 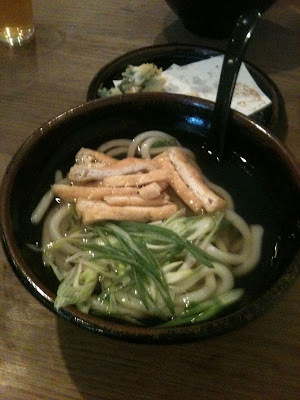 The udon were thick, with a slight chew, and the incredibly clear lightly flavoured fish stock felt like a detox. It was a nice way to end a rather hectic week. Doesn't sound very Japanese to me. Maybe I went to the wrong places but I *never* saw tempura and udon on sale at the same place! Now I think about it the restaurant I went to on my brief visit to Tokyo were very specialised. I went to a katsu restaurant that served about fifty different types of katsu and nothing else. Even if they are mixing their cuisines I think this place is pretty authentic.